Marty and I believe in being prepared for emergencies so I’m sharing this emergency preparedness food storage list. You never know when a freak snowstorm will leave you stuck at home for a week (or when zombies will attack) so it’s a good idea to be prepared. I’d hate to be stuck at home and realize that I am out of the basics I need to feed my family or take care of them if someone is sick. For this reason, we make sure that we have a stockpile of food and medicine just in case. The amount you should keep on hand really varies depending on how many people are in your family and what you’re preparing for. The government recommends that we have at least two weeks of food on hand at all times for emergencies. We believe that more than that is a good idea. So, what should we keep on hand? Again, it varies greatly depending on how many people are in your family and what you are preparing for. We tend to keep shelf stable items on hand because I have no desire to lose power and have an entire freezer full of emergency rations go bad. We lose power a lot in the winter in rural Vermont so it’s a real issue for us. One of the biggest problems that I have had is reducing food waste when stocking for emergency preparedness. It’s important that the food you store be good when you need to use it. That means that you need to rotate it regularly and store it in a way that keeps it fresh as long as possible. 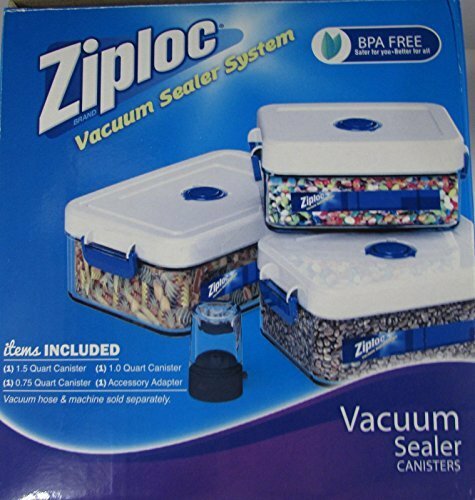 I have been storing our dry goods using the Ziploc® Brand Vacuum Sealer System (v159) to help extend the life of our food storage. This emergency preparedness food storage list will give you an idea of how long things will last. The thing that always got me was the last one on the list – “indefinitely in proper storage containers and conditions”. You need to keep out air, bugs and moisture or your food will go bad. A vacuum sealer system like the Ziploc® Brand v159 Vacuum Sealer System keeps food fresher longer compared to conventional grocery store packaging. This is a very versatile vacuum sealer system because it can be used with rolls, bags and canisters. Not only that, many chip and cereal bags can be resealed using the Ziploc® Brand v159 Vacuum Sealer System so you don’t need to transfer the food to another bag. I can vacuum seal foods in a variety of different quantities depending on how much I’ll use at one time. There are quart, gallon and half quart sizes so I put things like flour in the gallon bag and instant coffee in the half quart size. 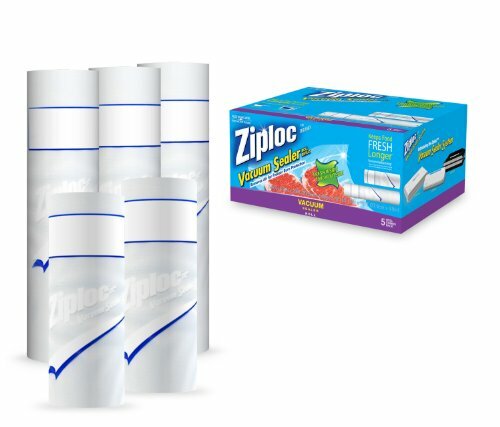 The Ziploc® Brand v159 Vacuum Sealer System can also be used with food that will go in the freezer or the refrigerator. I’ve used it to reseal cheese so it doesn’t go bad and to freeze individual hamburger patties to cut down on time making dinner. It even has non-food uses! Did you know you can use it to store your photographs or your passport so they aren’t damaged? The Ziploc® Brand v159 Vacuum Sealer System is a great gift idea this holiday so make sure you visit the Ziploc® Vacuum Sealer System Website for a coupon on your purchase. This is a great idea. Those noodles and popcorn will probably last forever. Great idea! I agree, Leslie! It's so handy to have! I have always wanted one of these sealer systems! Thank you for the review! You bet! I really love how easy this is to use! I have been thinking about getting one of these. I really need to do it. I definitely recommend it, Debi! Here in the south where it is hot and humid food goes bad quickly. Good to know how to preserve it for as long as possible! I'm sure it must be a challenge! I have wanted a vacuum sealer for forever. We throw out more food than I'd like, and I know this would extend the life of much of it. Plus I could buy more in bulk from a co-op or Sam's Club and portion it out into more usable portions without it all going bad. The Ziploc sealer is so easy to use! I love that you can make your own size of bags, too. It's really versatile. I agree, Dede. It's really handy! bit confused about the canned foods section "1 year (or before date on package): canned fruits, meats, soups and vegetables, peanut butter & jelly, nuts" Canned foods (from the supermarket for example) only go off if the integrity of the can is compromised and usually there are tell tail signs of this visible on the can itself. Unless your talking about a different type of can? or canning? Hi, Jamie - Nothing lasts indefinitely even if the can looks OK. If there is no date on the product, I would rotate so that I was using older things first. Home canned products, I would use within a year. Just use your best judgment and remember to rotate foods. Honey I vacuumed just about everything in my house you can think of!! Awesome! We are the same way! I have found that grains really need to be frozen a for 2-3 months to kill off any insect eggs that could be hidden in the grain. Thanks! I'll certainly keep that in mind.